So, here we are, months and months later, still trying to conceive biologically. Part of me wonders: is this God's way of telling me that adoption is the only way to go? His perfect plan? Or am I supposed to "learn something" from this struggle? Should we keep persevering? Who knows. Dear hubby says there is no such thing as the "right answer" or "right choice" - there is only the choice we make in the moment, that's all. I don't know, though. Do I believe in "fate"? God's destiny for any one person? If so, then there is a correct answer to this struggle we're going through. There is a decision we're supposed to be coming to; it's just not obvious to me ..yet. In the meantime, I've been reading about both natural birth plans and mid-wives and doulas as well as keeping up on my adoption literature. Being the child of an adopted mother, I think - no, I know - that I am acutely aware of many of the issues of adoption...the psychological, the emotional, the relational, etc. While I have not gone through the process (and consequent issues) personally as an adoptee, I have been on the forefront with my mother as she struggled as an adult through all of the messy emotions and psychological issues that plague those who have been adopted who have not been transitioned properly from biological loss to their new adopted realities. 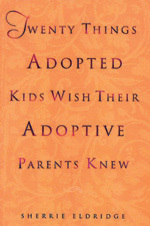 The book "Twenty Things Adopted Kids Wish Their Adopted Parents Knew" by Sherrie Eldridge had been suggested to me over and over again; so, I finally downloaded it to my Kindle and settled in for the read. I found myself blown away by the similarities between what Eldridge was describing from her own personal experience as well as the experiences of so many other adoptees and my own mother. I will not go into all of the issues that Eldridge explains in her very insightful book, for they are far too numerous and extensive to even touch on in one blog; but I will say that delving into this book is not for the faint of heart, especially if you are intimately touched by adoption (an adoptee, adoptive or perspective adoptive parent, child of or relative to an adoptee, etc.). I have to say that as a potential adoptive parent, I am both overwhelmed and strengthened by what I've read. 1. Am I "good enough" to be an adoptive mom? 2. Will I ever be able to be strong enough/wise enough/fair enough/attentive enough to be all of the things I need to be as an adoptive parent: clinician, psychologist, detective, loving caretaker, etc.etc.? 3. Will my child respond to my love and care, or will s/he end up hating and resenting me? 4. How will my husband and I be able to reconcile our heritages along with a child from another country/culture/race (since we are adopting from Ethiopia) without "messing it all up" royally? Can any of this be done? Will we be okay? How will our family be formed? Oh, if only I knew how everything will turn out! I would love to know what the future holds, but in the meantime I will have to continue filling my head with as much information as I can. Thank God for those willing to share their stories like Sherrie Eldridge; it helps to comfort me in a strange way to think that perhaps everything truly will end up okay in the end. To buy Ms. Eldridge's book on Amazon, click the book title link above. It is available in paperback, hardcover, and Kindle download. By the way, you can buy Eldridge's books at Barnes and Noble, Amazon.com, Books a Million, Borders and more. They are highly recommended! Something that helped me was knowing that God knows the desires of our hearts. He will bring together everything in his perfect timing. Praying for you and looking forward to seeing the way He brings together your family!